ICCS-EM & ICCG-E Lent 2018 TOOL 1. For other languages (French, Spanish, Arabic) go to the Library (Activities/ICCS-EM)! 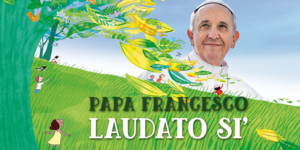 Introduction – Why Laudato Si? This Lent 2018 we would like to focus meditation on the contents of the Encyclical Laudato Si’. In it Pope Francis wishes to call attention to the importance of loving, respecting and safeguarding our common home. We cannot but admire the beauty and harmony that exists in all of Creation; it is the gift that God gives to us so that we can find Him and contemplate Him in his work. It is important to develop an “integral ecology”, in which respect for creatures mirrors the richness they encompass and puts the human being at the summit of Creation. Guides and Scouts around the world can play a very important role in this task of promoting care and respect for the environment, especially in this integral ecology. Our faith in God leads us to know God in his Creation, which is the fruit of his Love for us, and it calls us to look after and protect nature. Thus, it is necessary that we promote a true education, at all levels, which will help to spread a responsible and receptive attitude to the need to care for our world; and, in a special way, to protect, promote and defend human rights (cf. 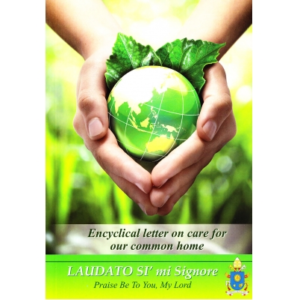 Encyclical Laudato Si’, n. 201). To start with, I can ask myself how this has been incorporated in my country, my city, my environment, in my religious belief, and of course in my Scouts & Guide Community. In other words, an integral education must teach people to take responsibility not only as a subject but as effective awareness. As far as this target is not attained, so to say we are still at the “kindergarten” level. Christians often speak of “praising God,” and the Bible commands all living creatures to praise the Lord (Psalm 150:6). All three terms contain the idea of giving thanks and honor to one who is worthy of praise. Lord, our Lord, how majestic is your name in all the earth! (vv. 1 and 9). Then heavens. the moon and the stars, follow. In the centre there is the praise by human beings that the Lord cares so much for! and the fish in the sea, “all that swim the paths of the seas”. This is also the Lesson from Laudato sii, lesson for all scouts and guides and all human being: we cannot truly praise the Lord if we do not feel ONE with all the creatures on Earth, that are our sisters and brothers, as St. Francis used to understand them so early as in the 13th century! Everybody is invited during a prayer time to write on two papers the bad habits, which they want to give up during the lent. A fire is switched to put one of the papers inside, the other one is kept (preserved) by each to keep it on him/her during the lent (in a pocket for exemple). Ashes will be kept (preserved) to reuse them for every prayer to do again the cross with ashes. It is a way of inviting everybody to remember itself during the lent, the bad habits that he/she wants to leave. The kept (preserved) paper will be thrown, in the fire (light) of Easter, as sign that with the resurrection each is renewed. In our everyday life, we rely too much on technology. We are no longer able to spend one day without our smartphone or our pc. Many people think that technology will definitely solve environmental problems but it sometimes solves one problem only to create others! The earth, our home, is beginning to look more and more like an immense pile of waste. Industrial waste and chemical products utilized in cities and agricultural areas accumulate in the organisms of the local population. Few or no measures are taken until after people’s health has been irreversibly affected. The throwaway culture reduces also people to rubbish! Our industrial system, at the end of its cycle of production and consumption, has not developed the capacity to absorb and reuse waste and by-products. We have not yet managed to adopt a circular model of production capable of preserving resources for present and future generations, while limiting as much as possible the use of non-renewable resources, moderating their consumption, maximizing their efficient use, reusing and recycling them. It is urgent to counteract the throwaway culture which affects human life and life on the entire planet: and we as scout and guides have to be good example for the others in that! During our 1st week of Lent let us engage to take care of all the persons we are going to meet with, considering them as a masterpiece made by God, and not as things we can freely dispose of. Let us ask Our Father in Heaven to give our generation the Bread of Wisdom to overcome the throwaway culture and be happy with fewer things in order to generously share with those who have less and weigh less in the world economic and social order. At this beginning of lent every boys/girls of the group (unit) is invited, to keep (preserve) all the recyclable waste : cardboards, papers, plastic boxes, pieces of threads… With all that each will have kept (preserved) during the lent, you can realize in team a garden of Easter which can decorate at the altar, for the morning of Easter! Each receives a big bag on which is written a sentence of the hymn of the creatures of Saint Francis of Assisi. The climate is a common good, an essential condition for human life and specially for us as scouts and guides. Volcanic activity, variations in the earth’s orbit and axis, the solar cycle may be involved too, yet most global warming in recent decades is due to greenhouse gases concentrated in the atmosphere (carbon dioxide, methane, nitrogen oxides and others) as a result of human activity and deforestation for agricultural purposes. The loss of essential resources like drinking water, energy and agricultural production in warmer regions, and the extinction of part of the planet’s biodiversity are tremendous consequences of global warming. Such effects will continue to worsen if we continue with current models of production and consumption. Humanity is called to recognize the need for changes of lifestyle in order to combat global warming or at least the human causes which produce or aggravate it. There is an urgent need to develop policies so that, in the next few years, the emission of carbon dioxide and other highly polluting gases can be drastically reduced, for example, substituting for fossil fuels and developing sources of renewable energy. But these good practices are still far from widespread. During this 2nd week of Lent, let’s us consider what means this words of the Lord contained in Leviticus 25:23: “No exchange of land may be for ever, for the land is mine, and you are as my guests, living with me for a time”. Let us try to adopt and spread around us a lifestyle that may convince all people to consider the climate issue as our own business and not as some problem that others (Government, politicians, and scientists) shall solve. Pope Francis is confident that we are still in time to stop or mitigate climate change if we all do each his part, and the Lord will bless our efforts to save “his” Land, that is our common house. Divide participants into 6 groups, each gets one flipchart paper, where they draw a blind map of the world. Write one of following question on the top of each group’s paper. After that, ask each group to answer this question by putting dots on the map representing the countries in their answer. Which countries do we learn about from the media? Which countries did you learn about in history lessons? Where do the authors of the books you read come from? Where in the world are people happy? In which part of the world would you like to change something? Which countries do our clothes come from? The groups move from one paper to another, slowly answering all six of them. How did you understand this question when making your dots? What can we deduce from our answers? What are our blank spaces? What do they tell us about the world and the way we learn things about it? How does our perception influence our relationships with other people in the world? How does it influence our behaviour? Some studies warn that an acute water shortage may occur within a few decades unless urgent action is taken. The environmental repercussions could affect billions of people; it is also conceivable that the control of water by large multinational businesses may become a major source of conflict in this century. However, access to safe drinkable water is a basic and universal human right, since it is essential to human survival and, as such, is a condition for the exercise of other human rights. Our world has a grave social debt towards the poor who lack access to drinking water, because they are denied the right to a life consistent with their inalienable dignity. Fresh drinking water is indispensable for human life, for health care, agriculture and industry. In many places water demand exceeds the sustainable supply, with dramatic consequences in the short and long term. Water poverty especially affects Africa where large sectors of the population have no access to safe drinking water or experience droughts which impede agricultural production. Some countries have areas rich in water while others endure drastic scarcity. Water continues to be wasted, not only in the developed world but also in developing countries which possess it in abundance. This shows that the problem of water is partly an educational and cultural issue, since there is little awareness of the seriousness of such behaviour within a context of great inequality. Unsafe water results in many deaths and the spread of water-related diseases, including those caused by microorganisms and chemical substances produced in certain mining, farming and industrial activities, especially in countries lacking adequate regulation or controls. Detergents and chemical products, commonly used in many places of the world, continue to pour into our rivers, lakes and seas. The Lord Jesus was thirsty after a long journey and stopped at a well in Samaria, asking a woman who was there alone to give him water (John 4). He is the one who can give us living water without vessel though the fountain is deep (vv. 10-11). This water is the Holy Spirit, that he grants to all those who call to him: “But whoever takes the water I give him will never be in need of drink again; for the water I give him will become in him a fountain of eternal life.” (v. 14). We as scouts and guides have to give good example in preserving the water and its resources! Aim: Participants realize that without any other modification or demanding technology only a very small amount of water on the earth can be used for direct human consumption. Hand out papers to kids representing all the water on the Earth. The children’s task is to stand on any of the papers but without touching the floor with their feet or any part of the body. After that tell them that most of the water on Earth is salt water, which is in seas and oceans and as such cannot be used for direct human consumption (or can be possibly used after desalination, which is very expensive and technically demanding process). Take away from them about one third of the papers and ask them to rearrange them so that everybody can again stand on the papers without touching the floor. The amount of papers taken away depends on the kids’ abilities and relationships within the group. Go on in a similar way. This time tell them that you have to take some more papers away as a part of fresh water contained in glaciers. Finally, you can take away papers representing water resources hidden deeply underground. At this stage, take away only a small amount of papers, depending on the situation. It will be increasingly harder for them to find a space on papers. You can comment on the situation. After the last stage of taking papers away, wait till all children stand on papers and nobody touches the ground. No matter if they succeed or not, end up the activity and sit down in a circle again. Talk for a while on what this activity was about and what it was supposed to illustrate. Encourage them to guess what part of the total water amount on Earth can be used for direct human consumption (little less than 1%). Together revise in what form water on Earth exists (seas and oceans, glaciers, underground water).